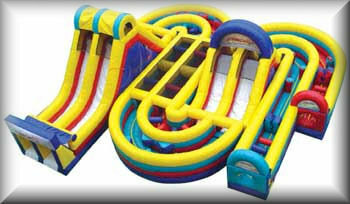 The largest inflatable obstacle course available for rent in the Dallas, Fort Worth area. The Adrenaline Rush Obstacle Course is three sections joined together making one big course. This incredible inflatable measuring 1850 sq feet has separate lanes, with a staggered start, so participants travel the same distance through this spectacular course. We will deliver this unit anywhere in the Dallas, Fort Worth area at no additional charge.